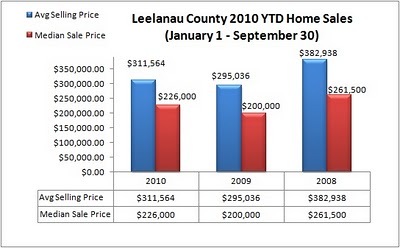 I have calculated the updated 2010 home sales data for Leelanau County and have posted the information below in several charts. 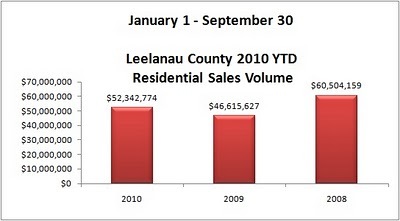 The sales statistics compare housing sold in Leelanau County from January 1, 2010 through September, 2010 to the same time period in 2009 and 2008. This includes the townships of Bingham, Centerville, Cleveland, Elmwood, Empire, Glen Arbor, Kasson, Leelanau, Leland, Solon, Suttons Bay, and the City of Traverse City within Leelanau County. As expected home sales are well ahead of 2009’s numbers and current record low interest rates aren’t hurting as we transition into the end of fall. 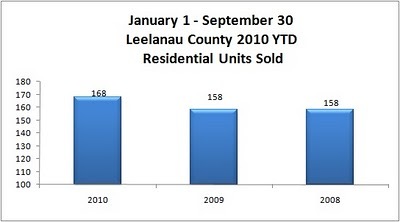 In Leelanau County the number of homes sold has increased 6.3% in 2010 over 2009. Median sale price and average sales price has increased in 2010 over last year’s values 5.6% and 13% respectfully. Sales volume remains ahead of last year’s pace with an increase of 12.2% to date. Grand Traverse County and Traverse City has been seeing a large increase in real estate sales during 2010 as well. This report is based upon sales information obtained from the Traverse Area Multiple Listing Service from 2008-2010. Undisclosed sales are not included in the data. This is for basic review purposes only. All attempts for accuracy have been made but cannot be guaranteed.